To so many, parsley is thought of as just a garnish, but not I. To me, parsley is an ingredient to be celebrated as much as other favorite herbs like basil or salad greens such as arugula, field greens and others. It shows up regularly, pretty much daily in my meals, sprinkled atop sliced eggs on toast or over pasta or mixed into any number of recipes, it adds a freshness like no other to just about any savory dish. 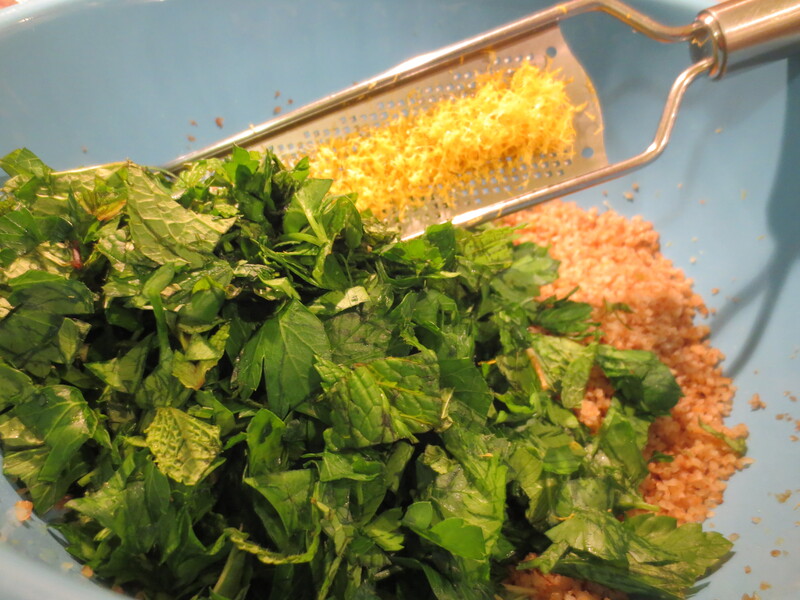 But here, parsley becomes the star, no longer a mere garnish, parsley is the main ingredient in this simple lovely salad. 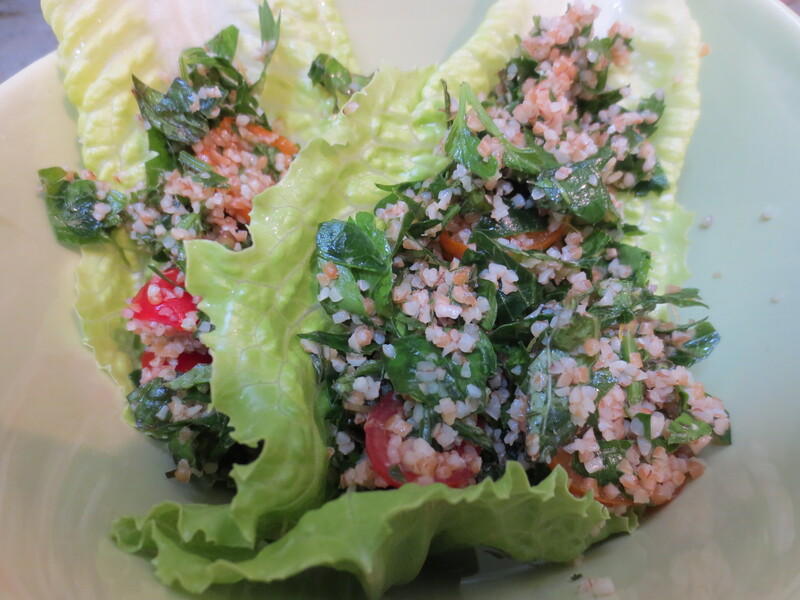 This truly is traditionally a parsley salad with bulgur, mint and tomatoes playing the supporting roles. 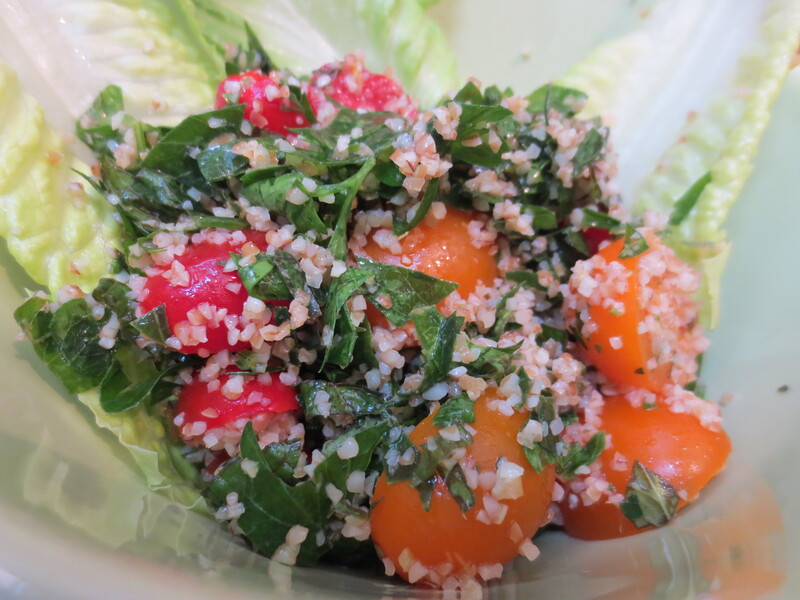 I like my tabbouleh with extra lemon, so feel free to add less if that’s not to your liking. Either way, this is a quick, simple, yet wonderfully delicious dish that itself could be the star of the meal. Rinse bulgur in a tight mesh strainer under cold water and then drain thoroughly. Pour into a medium bowl. *See notes below if you wish to use Quinoa. Zest your lemon (before juicing). 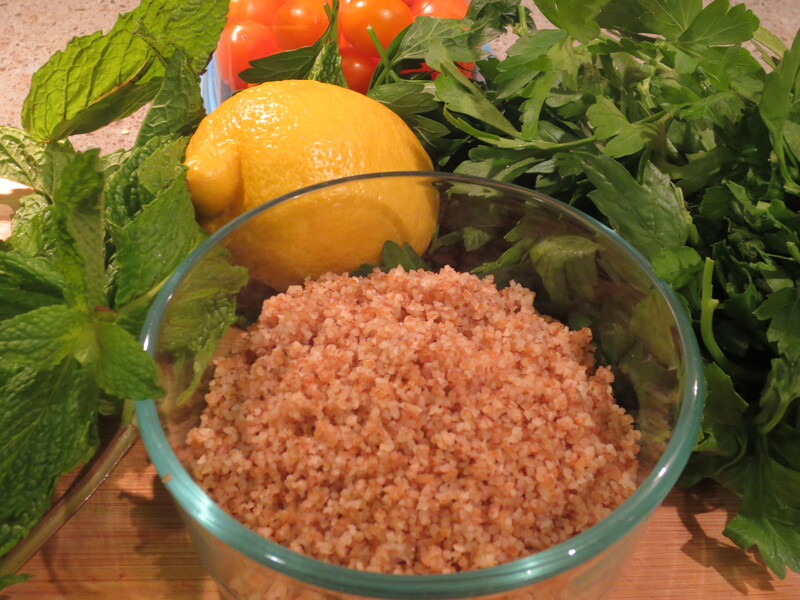 Add lemon juice and olive oil to the bulgur, add less to start with as you can always add more lemon juice after tasting, but you can’t take it out. Allow to sit for a few minutes to absorb the dressing. If using medium or coarse grain bulgur, you’ll need to add a little hot water to soften the grain, before adding the dressing. Meanwhile, wash and dry parsley and mint leaves and chop. Add to the bulgur along with the lemon zest, salt and pepper and scallions if using. Stir to combine. Cut the tomatoes in half or quarters, depending upon the size and what you like. Add the tomatoes to the salad and gently stir. Taste, adding more lemon juice or salt and pepper as you like. Can be served chilled or at room temperature. Enjoy! It’s best to let the salad sit for a bit of time before eating to allow the grain to soften and fully absorb all the flavors of the dressing, herbs and tomatoes. If I have time and actually think ahead, I mix the bulgur with the olive oil and lemon juice and leave in the fridge overnight, before adding the remaining ingredients, but this is not necessary. 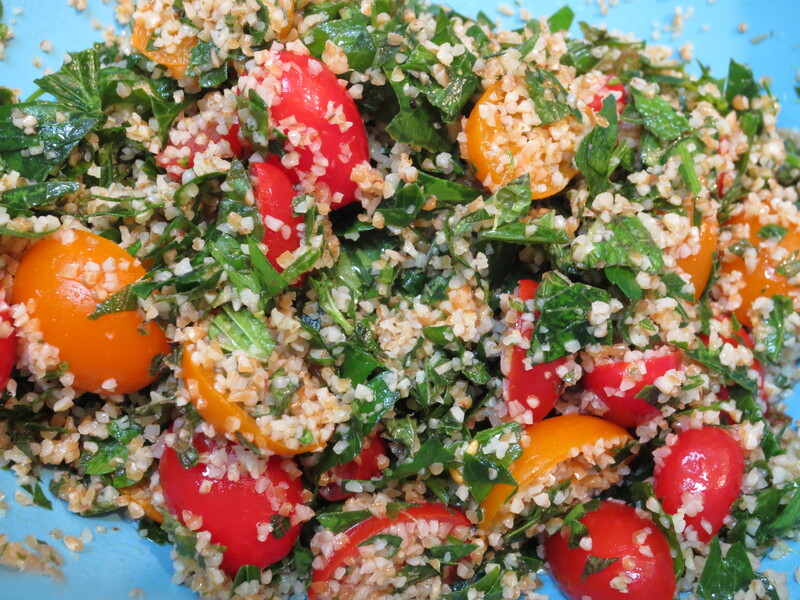 Tabbouleh can be served in so many wonderful ways. I like it simply in Romaine lettuce cups or added to a hummus wrap or falafel sandwich or atop a larger green salad or served alongside your favorite fish. It was also my contribution to the family Easter brunch, served along side my dad’s amazing quiche and goat cheese tart. Parsley has numerous health benefits. It is an excellent source of Vitamins K (one half cup serving provides over 500% of your daily value!) and C and also a very good source of Vitamin A, folic acid and iron. It is high in numerous healthy flavonoids. All of which means parsley is good for your heart, joints, digestion and more. Bulgur wheat also goes by the name cracked wheat, it is high in protein and fiber and low in fat and calories, an excellent substitution for other grains such as brown rice or oats. *BUT, if you can’t find bulgur or wish to make this wheat/gluten free, I find Quinoa makes a perfect substitute for the bulgur. If you do use Quinoa, you’ll have to pre cook it, I would probably use about 1/3 cup uncooked to 2/3 cup water, brought to a boil and then covered on a low simmer for 15-20 minutes. Quinoa increases in volume by a lot, so don’t be concerned by the small amount at the start.